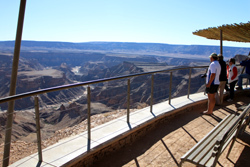 Hobas Camping Site Fish River Canyon accommodation guide everything you need to know before visiting Hobas Camping Site Fish River Canyon Namibia. 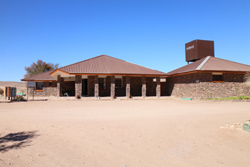 Photographs, room types, activities, facilities, location booking information costs rates and prices for your stay at Hobas Camping Site Fish River Canyon, read all the accommodation information about Hobas Camping Site. Hobas Camp is the Campsite at the start of the Hiking Trail at the north end of the Fish River Canyon. The camping site at Hobas is one of the few in the area offering shady trees to camp amongst. 14 x Campsites set among shady trees at the top end of Fish River Canyon. 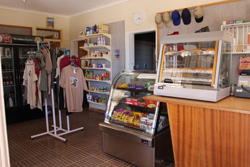 Ablutions, Braai/BBQ area Swimming Pool and a Kiosk selling basics and cool drinks. Hobas is located close to the main view point and for the canyon Hiking this is the start of the famous four day Fish River Hiking trail. 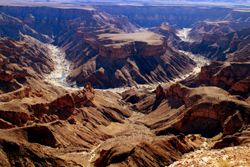 Located inside the Ai-Ais Richtersveld Transfrontier Park in the very south of Namibia , the Fish River Canyon is one of the largest canyons in the world. Around 160 km in length and reaching a depth in excess of 500 meters, it is one of the main tourist attractions in the south of the country. Ranked as one of the top hiking trails in Southern Africa, the Fish River Canyon Hiking Trail takes backpackers on a journey along its river course. Hemmed in by sheer canyon walls, towering above the meandering river; the trail stretches between the northern-most viewpoint overlooking the Fish River Canyon and the thermal hot springs of Ai- Ais.